The Cavagna Group is a world leading manufacturer of equipment and components for controlling compressed gases (energy gases, alternative fuel gases, medical gases, industrial gases, and specialty and cryogenic gases). It was founded in 1949 with headquarters in Northern Italy, close to Brescia which is historically renowned for its metal processing industry. The Group consists of nine vertically integrated production companies in Italy and nine others spread across five continents. Its product is sold in 135 countries through a distribution network consisting of 15 fully owned distribution companies. For more than 60 years, Cavagna group has been developing innovative solutions and state-of-the-art gas control technologies. With its advanced technologies and manufacturing process, it has achieved global presence and become an undisputed world leader in the industry. Cavagna LPG valve and tank equipment division designs and manufactures LPG valves for different kinds of applications. In addition, it makes LPG filling heads and refrigerant gas valves. Safety and reliability are essential features of each valve. These valves, designed as primary shut-offs to control product discharge in LP-Gas service, are predominantly used in the liquid used in the liquid and vapour openings of bobtail and other transport vehicles. 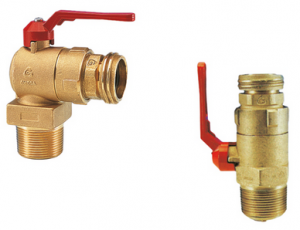 All valves satisfy the requirements of NFPA 58 and can be used in stationary applications. All Cavagna internal valves have a robust, one piece body design and an incorporated excess flow function. Each valve has a weak section that allows the pump or piping to “shear” in the event of an accident, thereby leaving the valve mechanism intact. 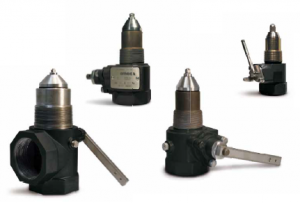 Cavagna threaded valves are compact and can be operated either manually or remotely via cable or pneumatic control. Valves contain spring-loaded, PFFE packing providing excellent leakage protection and the standard disc material provided is Nitrile. Cavagna flanged valves, equipped with a built-in excess flow valve to prevent uncontrolled product release, are perfect for mounting a pump or other similar piping connections. Mounting bolts weakened section, provided, allow the pump or piping to “shear” in the event of an accident, thereby leaving the valve intact. Cavagna flanged valves have a protection filter to avoid pump contamination from dirt and particles, easily removable when the valve is installed on the filling piping line Cavagna flanged valves contain PTFE packing providing excellent leakage protection and the standard disc material provided is Nitrile, they can be operated manually or remotely via cable or pneumatic control. Valves are designed to be mounted on the bottom of customer storage tanks for liquid service. They may also be mounted on the top for vapor service. Double back check construction where there are: a soft seated up back check, and a metal-to-metal lower back check seat. Efficient Flow Characteristics – The efficient flow channel design of the valves gives low flow resistance, prolonging pump and hose life, and high filling capacity. Sealant pre-applied on the tank connection threads on both valves. 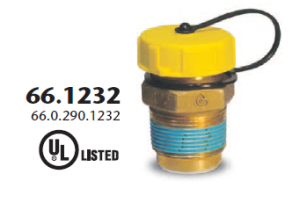 Valves are UL listed. Smaller filling upper chamber to avoid waste of liquid propane during every filling operation. Valves are furnished with yellow plastic caps with strap attached. Double check filler valves. Soft seated upper back check and a metal to metal lower back check seat. 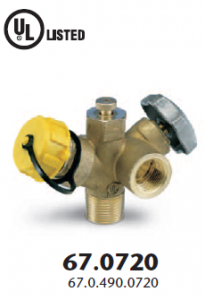 Incorporates an emergency ball shut-off valve. These two versions can be used either for underground or above ground LPG tanks thanks to an oriented easy to connect design. Multi-service valve suitable for ASME tanks where a vapor service valve is required. This valve incorporates in the same body a service valve, a vapor withdrawal valve and a fixed level gauge. Improved Stem Seal – Two seals – a back seat and an O-ring (both TFE coated) protect against stem leakage in the service valve portion. When the service valve is fully open, the O-ring is not under pressure, increasing the service life of the O-ring. Redesigned Body Configuration – Installation of the 67.0720 can be made with a standard 1” socket wrench using the large center wrenching hex. The extremely low body silhouette (approximately 2-3/4”) allows the use of small, economical hoods. Convenient Level Gauge – Top mounting of the fixed liquid gauge gives easy access. Gauge Connection – The ¼” F.NPT gauge connection can be plugged or left unplugged for installation of a pressure gauge. Fixed Level Gauge – Please specify DT length when ordering. Ever Seal – Pre-applied on the inlet thread. Various DT lengths upon request. Designed specifically for use as a primary pressure relief device on ASME containers up to 2000 gallon water capacity. Furnished with rain cap for protection against contamination. See ordering information for part numbers. All these valves have a pre-applied sealant on the container connection. All these valves are ASME approved.